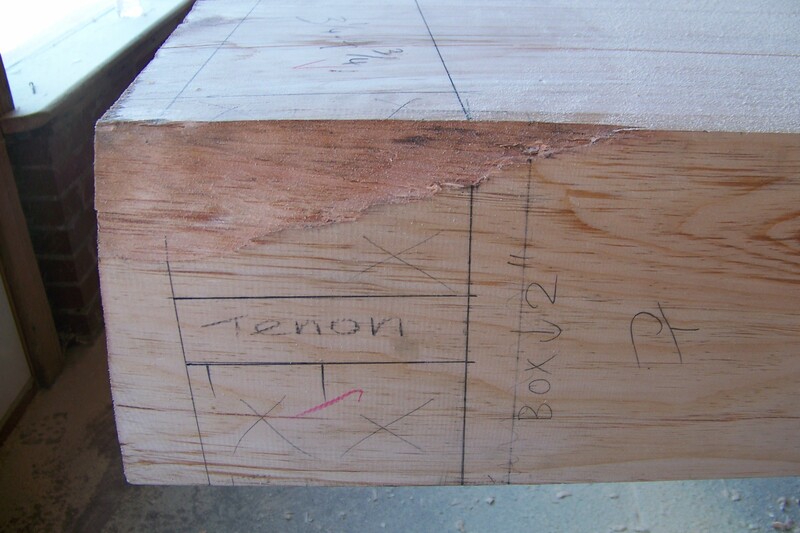 Ironically, when we put together the last line of the timber frame and tried to fit it in it’s final place, there was a 2″ mistake I had made. 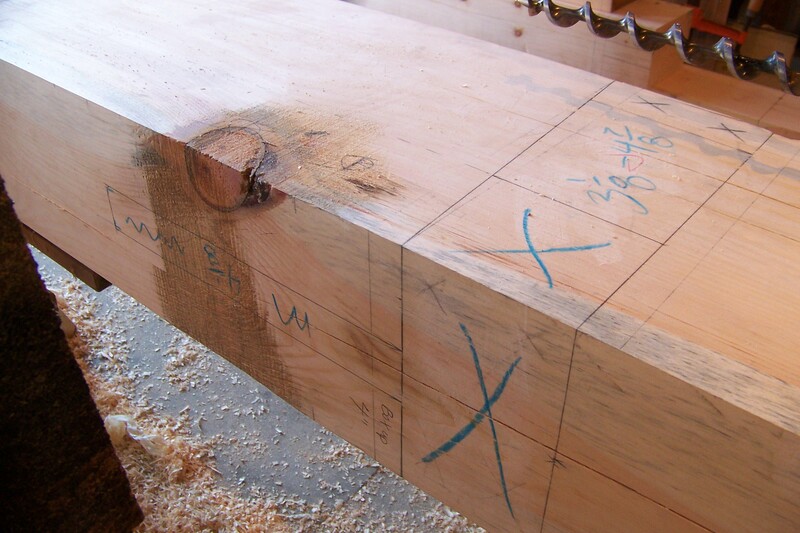 The brace was 2″ longer than the horizontal beam. In all the work we had done, this had to happen in the final piece of the puzzle and it stood out like a naked man in the snow (only, in a bad way). Today, several years later, Luke and I went back to the building to continue construction on Odie’s. This mistake was the first thing that had to be fixed before securing the joists of the upstairs floor. Luckily we figured out how to do it without taking it all apart. And after a good day’s work Luke hammered in the last wooden peg of our timber frame. It all fit like a glove. Yoohooo!!! Thank you Luke. I am so excited. Onto the next project. I loved Blackstone from the first time I saw it. I could feel it’s history, by looking at the old buildings. A lot of it needed some TLC, but that was part of the excitement and helped remind me how long it has been around. It had a lot of character. Blackstone is a little larger and definitely different from the Town of Floyd, but there is this old feeling, something of it’s own that longs to be enjoyed. I wanted badly to get to know one of these buildings inside-out and fix it up nicely. Mark did a lot of work for Gilmore Environmental in W. Broad St. He saw that the old building with “WINN Saw Sharpening” next door became available. Here was our chance to become part of this historic town. Soon after we bought the building in 2008 we started cleaning up. We took down the walls, staircase and peeled away several layers of ceilings. The upstairs floor span was wide and could certainly use some support in the middle. Having seen this old trade being done in Floyd, we thought it would be great to build a timber frame structure, to support the upstairs floor. It sounded like a new and exciting thing to learn. How to get them in? 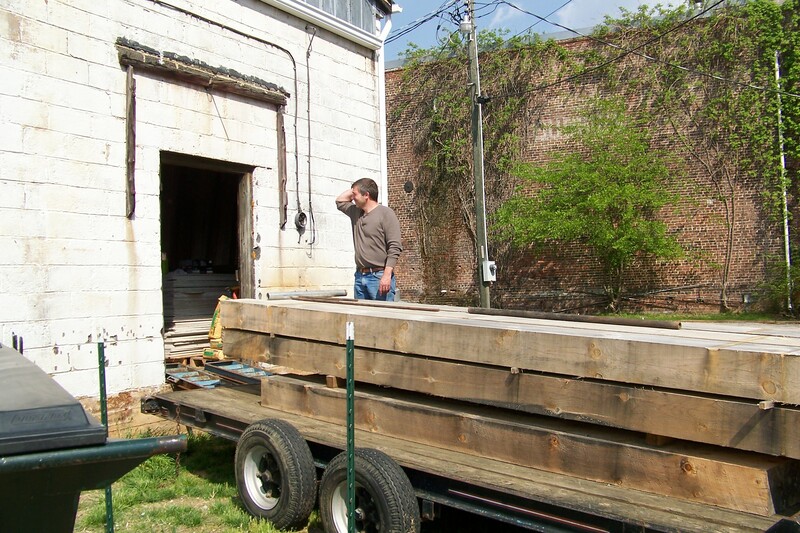 So we bought the lumber (white pine) from a small mill up in the hills of Hillsville and hauled them here to Blackstone. While the wood was drying, we started making our plans for a coffee shop. We had to think of things in great detail. What appliances need to go where, work flow and customer space. We had to do this all ahead of time in order to design the structure. It was not easy. After the frame goes up, you don’t just move one of the posts, you know. Finally, when the building was prepared, the wood was dry enough and the plans were in place, we started trying to figure out how to build a timber frame. We bought a book and started looking around on YouTube. Soon we realized that the job was not as easy as we had hoped. It takes specialty tools and the info is rather scarce. Definitely hard to understand for me, as I am not a carpenter and have actually never worked with wood like this before. Our boys still live in Floyd and have a band called Spoon Fight. The bass player told us we must speak to his Dad, as he may be able to help. It appeared he has built many frames both by himself and with a company called Dreaming Creek. He was so nice as to offer to come visit us here in Blackstone and show us how to do this. We had a great time. We were allowed to use his tools and he was a great teacher. He showed us how to do certain things, explained why, then let us do it under his supervision and then let us do it by ourselves and just checked our work before cutting. He ended up staying with us for two and a half weeks. This was a wonderful course and experience for us. We were very privileged to have him as a teacher. Over the years he has done some awesome work. Here is a link to his website: Lake Smith, Appalachian Rhythm. 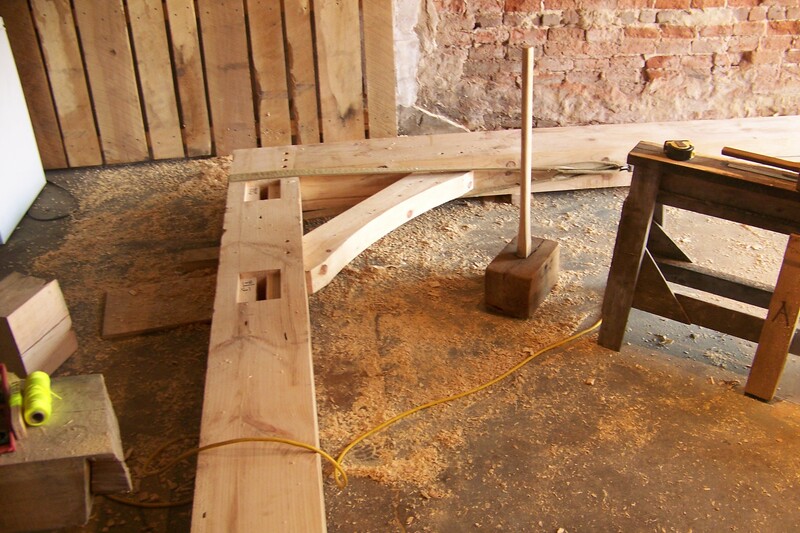 Besides beautiful furniture, he built some complex timber frames. This house on the left Lake built for some friends in Floyd. Check out his link for more details. In Floyd County there are quite a few buildings built this way. 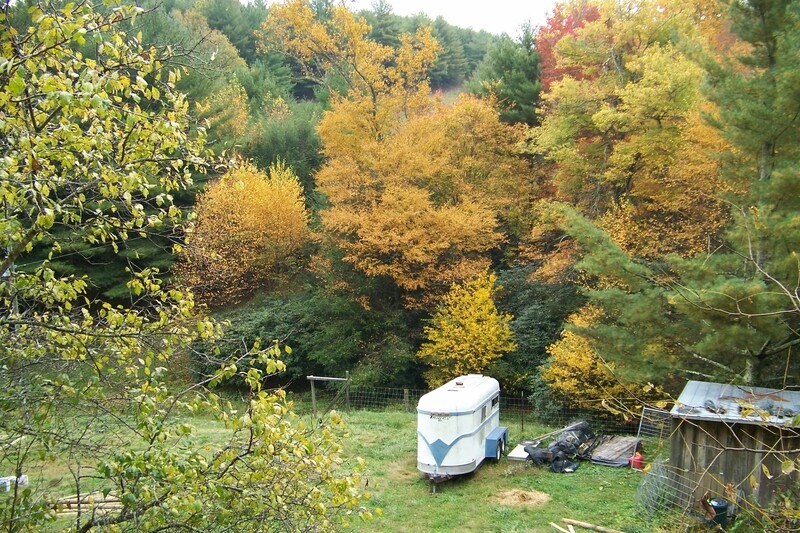 The Floyd Fest is a festival on a large property next to the Blue Ridge Parkway. 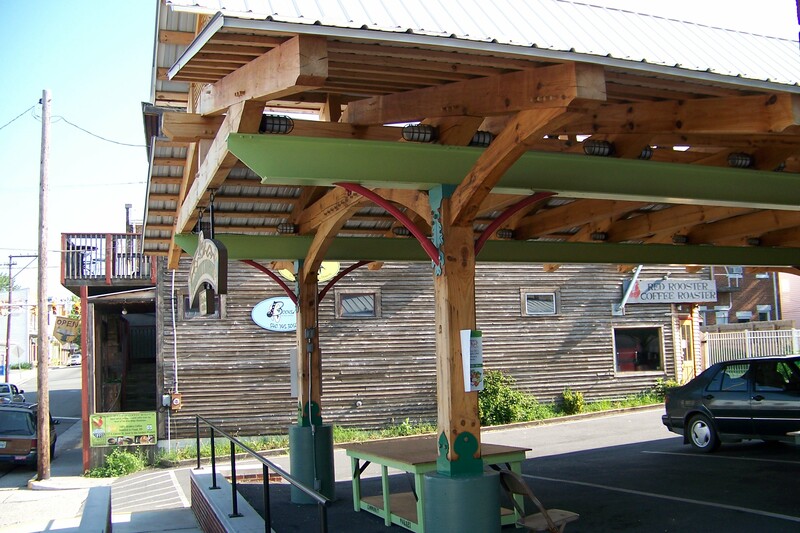 Their main stage and some smaller stages are built with timber frames. 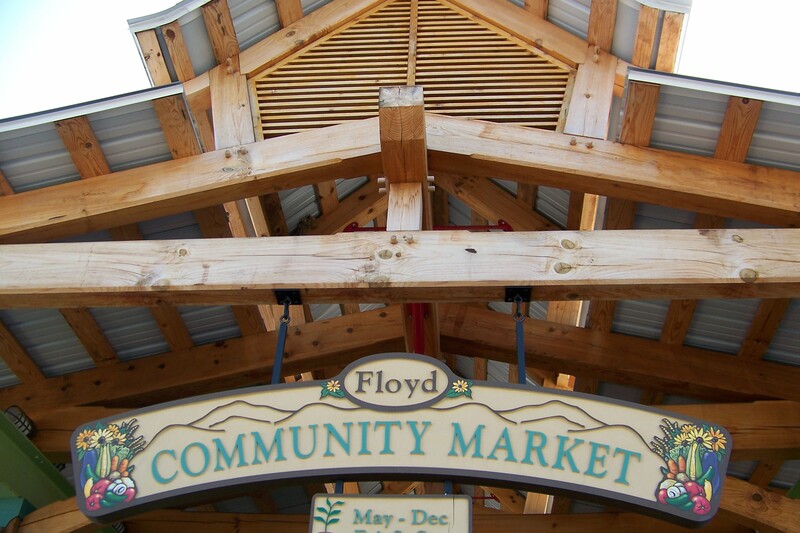 The town of Floyd had an historic facade grant sweep through and to keep it in the Floyd style, they decided to build with a lot of timber framing. Bottom Left and center is a place where they have a market every Friday. During the day it is a parking lot for the shop owners and employees. 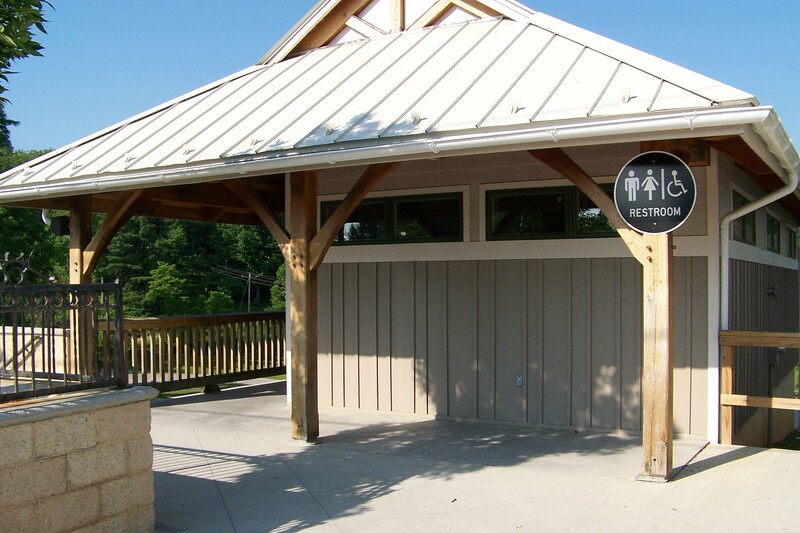 Bottom Right is a Public Restroom for all the people that come listen to the music on the street. I had made my design of the Coffee Shop and the frame in Google Sketch. That way I could walk through the shop and see what’s where etc. On the right you see three posts. That is Line 1. We did that one together with Lake. It took the three of us 19 days, including making sure it all fit together. We took it apart again and it is now stacked, waiting for the final assembly. Mark and I are on our own to do the rest. Actually, we have been at it for four weeks since and we are ready to put some of them up. We are so excited. Here is what we need to do with all Lines. Planing, Squaring, laying-out (drawing the joinery plans on the wood), scribing (cutting of the joinery), pre-assembling, squaring the frame (making sure all the pieces fit together straight and square), measuring and drawing where the braces go, taking it all apart again, scribing the joinery for the braces and making sure it all fits. And that does not even talk about the chamfering, sanding and oiling the pieces before the final assembly. Just like learning to drive a manual car for the first time, if you do it intensively and often enough, you go to sleep with it and dream about it all night. The same with learning how to build these. But after a while you get used to the new terms the “real” framers use, their methods and start understanding the concept. I have learnt one important thing…it is VERY time consuming. For those who are interested, in a later post, I’ll tell you some details of the procedures and what we had to learn. Well…what we attempted to learn, because man…I am doing the laying out of the joinery on the wood with pencil, and I constantly draw them incorrectly and have to start all over again. It makes this whole thing time consuming and frustrating at times. When we are all done…here we go again, dreaming about the future… we hope this will look nice and people will enjoy seeing how this old craft was done. We cheated a little with modern tools, but the principle is still the same. We are enjoying the project completely with all its frustrations. If nothing else, we tick that experience off our list. We love to share our experience with anyone who dares setting foot in our shop. The risk, I have to tell you, is that you will probably have to drink a cup of coffee with us, endure a tour and sit through a detailed explanation on how things are going and most of all…we might just hold on to you and have you volunteer some of your time and skills to help us get finished…because it is TIME to get our COFFEE SHOP up and running. After having lived an exciting and adventurous life in South Africa, Mark and I moved with our two sons, two dogs and four cats to the USA in 2003. 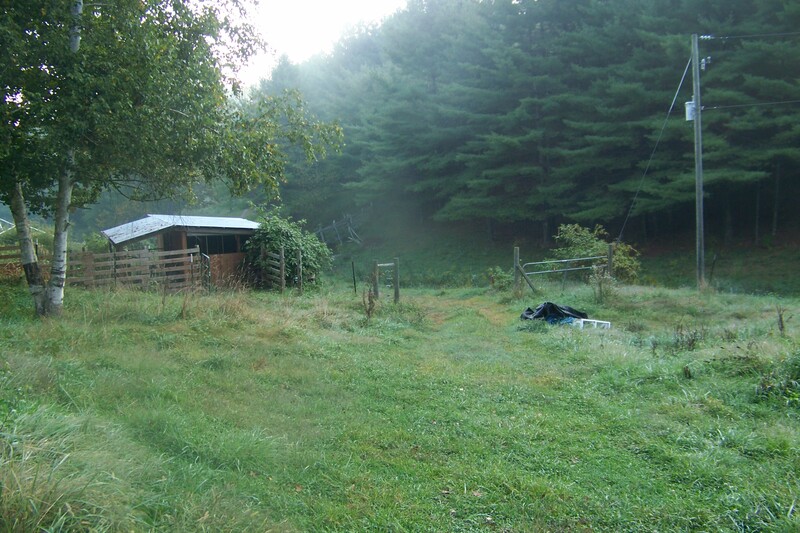 Our first 6 years in America were on a rural piece of land up in the hills of Floyd County, Va.
Floyd County is beautiful. That is if you like farmland. It has 321 sq. miles of green hills and cows with a population of 15,418. Apart from the mountains being astonishingly beautiful, peaceful and mind clearing, the people are relaxed and friendly. 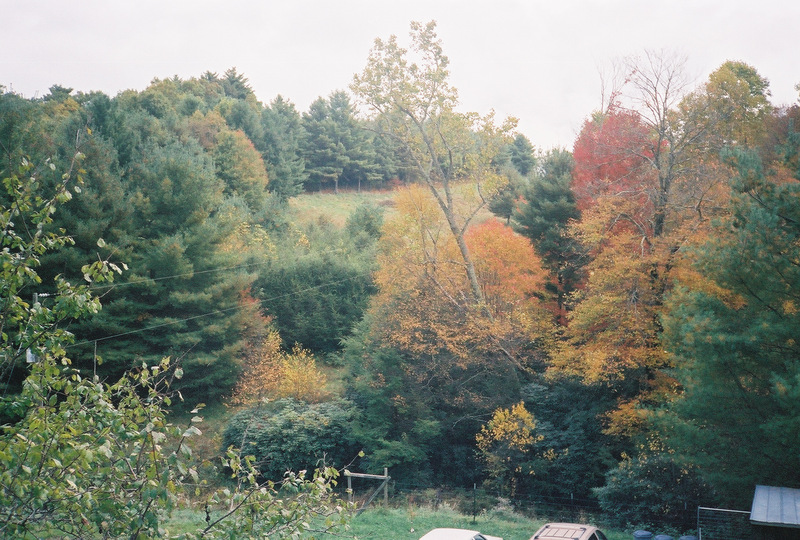 During fall, the colors are amazing. People come from long ways to view the spectacular views on the blue Ridge Parkway. Where we lived, 30 minutes away from the town of Floyd, the slippery hills and a few feet of snow made it easy to not be able to get out for a week or so. Just us, our pets, the firewood and some stored food. It was adventurous and exciting. But the excitement of music and entertainment happens in the small town of Floyd. (There are also some yearly festivals at the Blue Ridge Parkway). The Town of Floyd is tiny. It only has one stoplight. In fact, it is the only stop light in the whole County. The buildings are old and there’s an organic atmosphere. People enjoy being outside on the streets. Young and old mingle to dance and play music. There’s always some music on the weekends and sometimes during the week. Here’s a link to The Town of Floyd. Every Friday night there are people coming to perform on the street. It is not organized by anyone, they just come with their instruments and start jamming. It’s like a little festival. There are perhaps four or five different groups playing different kinds of music accross the street, but most of it is Country and Blue Grass. People gather from all over to listen. The dancing happens mostly inside the Country Store. Nextdoor at the Dogtown Roadhouse Pizza all kinds of bands come from all over. They have a music hall with dance floor. There’s a large stage with lights and inhouse PA. They play Rock, Blues, Jazz or whatever. They serve alcohol, but youngsters are allowed in. So far there have been no problems with under 21 kids enjoying the music while the adults drink. They also has a smaller stage for the new and upcoming bands. SPOONFIGHT…those are our little boys. 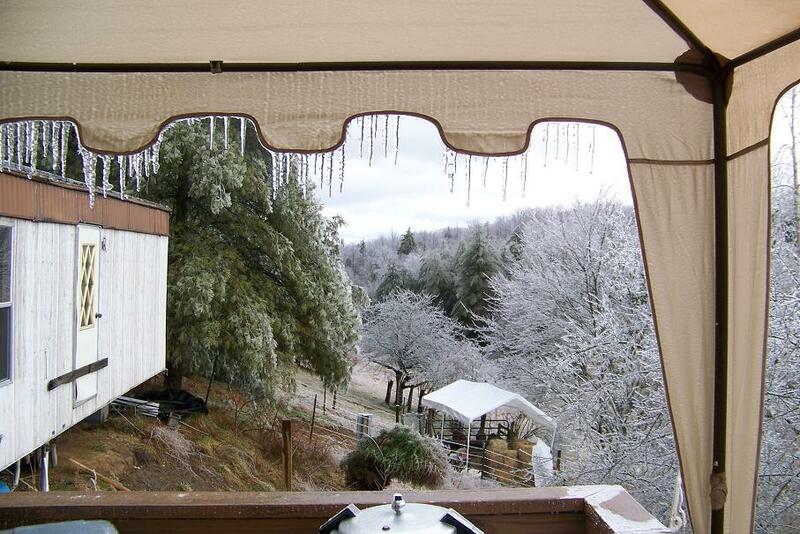 We loved living in Floyd County, every minute of it. But, Mark ended up working in Nottoway County most of the time (some four hours East). So we moved with our cats, dogs, goats, llamas and sheep. 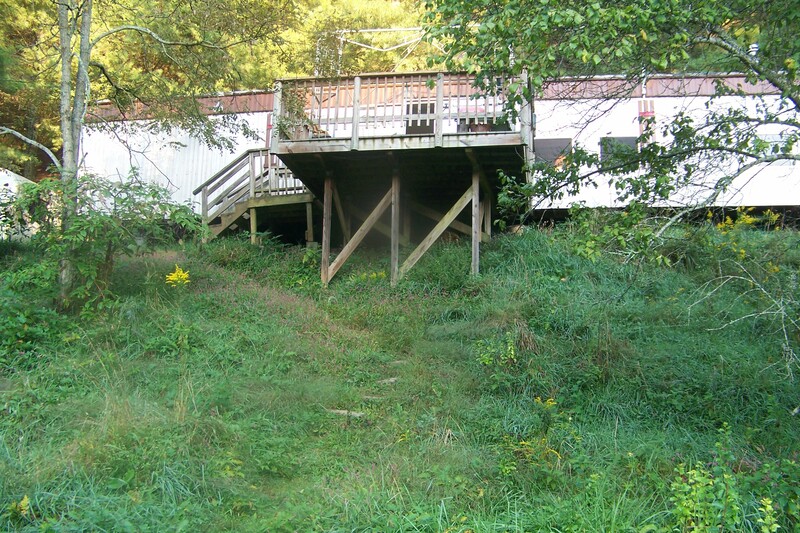 We left the property and our grown boys behind (they had girlfriends and music they could not separate from). Now we live on some acres near Burkeville, and are renovating an old building in the historic part of Downtown Blackstone. It’s a pity we could only find it available in the adjacent (757) area code. That will cause some confusion for people who use the numbers (634-3748), but the letter spelling was too good to pass up! The number will be going to voice mail until we are open, but feel free to check it out. Check out Google Voice to get a vanity number, to save your cell phone number when changing (or canceling) your phone, or to add functionality to your phone number. I’m still testing the new features it offers, but I like what it promises! We want Odie’s to be a place where people visit with each other. Folks should come to Odie’s to see their friends, listen to their music, admire their artwork, join them for club meetings, and otherwise connect up together. We’ll bring the refreshments.